ab99697 reacts with the light chain of native Rabbit IgG primary antibodies and does not bind to the reduced and denatured Rabbit IgG heavy chain band (50kD). Our Abpromise guarantee covers the use of ab99697 in the following tested applications. Note: This antibody is not recommended for sensitive or quantitative detection of the reduced and denatured Rabbit Light Chains on Western Blots. IHC image of beta actin staining in human colon formalin fixed paraffin embedded tissue section*. The section was pre-treated using pressure cooker heat mediated antigen retrieval with sodium citrate buffer (pH6) for 30mins. The section was incubated with ab8227, 3µg/ml overnight at +4°C. An HRP-conjugated secondary (ab99697, 1/8000 dilution) was used for 1hr at room temperature. The section was counterstained with haematoxylin and mounted with DPX. The inset negative control image is secondary-only at 1/4000 dilution. LAP2 alpha was immunoprecipitated using 0.5mg Hela whole cell extract, 5µg of Rabbit polyclonal to LAP2 alpha (ab5162)and 50µl of protein G magnetic beads (lane 1). The antibody was incubated with the Protein G beads for 10min under agitation. No antibody was added to the control (lane 2). Hela whole cell extract diluted in RIPA buffer was added to each sample and incubated for 10min under agitation. Proteins were eluted by addition of 40µl SDS loading buffer and incubated for 10min at 70oC; 10µl of each sample was separated on a SDS PAGE gel, transferred to a nitrocellulose membrane, blocked with 5% BSA and probed with ab5162. 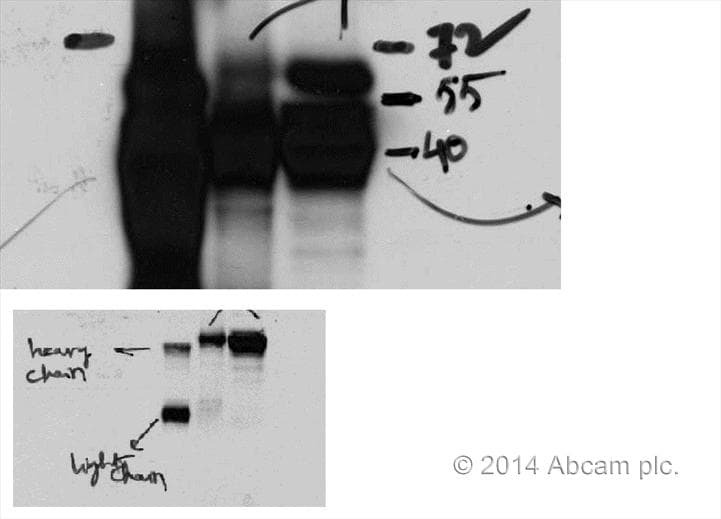 Secodary: Mouse monoclonal [SB62a] Secondary Antibody to Rabbit IgG light chain (HRP) (ab99697). Publishing research using ab99697? Please let us know so that we can cite the reference in this datasheet. My protein of interest is slightly larger than heavy chain making the use of usual (H+L) secondaries difficult for WB following immunoprecipitation. The two images exemplify the problem. The first is using a secondary that detects both heavy and light chain. Heavy chain band covers my protein of interest. The second image was obtained after stripping the membrane and repeating the WB, this time using ab99697. Now the heavy chain band in the IP lane has disappeared and is faintly existent from the previous experiment in the IgG lane. Good sensitivity as well. This example is 1:5000, but now I am using 1:10,000.